Back with one more interesting post . 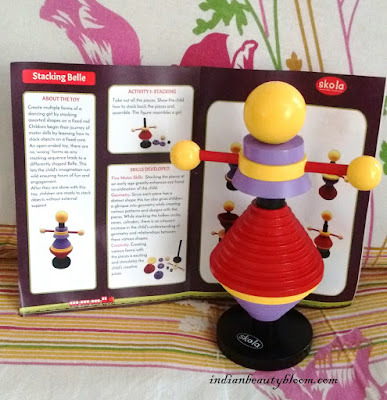 Today I am going to review a Toy named Stacking Belle from the famous Skola Toys . Skola Toys is an Indian Brand which has unique range of learning toys for children between age group 1 to 8 years . It’s Toys are made up of wood and are safe even for toddlers & infants . These toys are a great way to keep kids engaged in some useful activity like learning and also helps to keep them away from gadgets and Television . Stacking Belle is a type of Stacking toy . It helps to improve motor skills in kids . Also helps them to learn Geometry & shapes of objects . 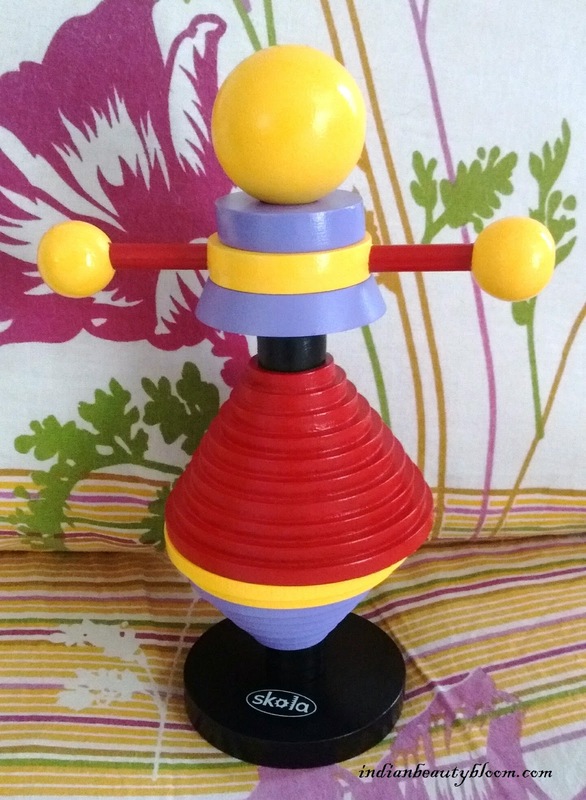 The Toy upon stacking Looks like this , A dancing Girl . It can be made in different ways , so that the child learns how to stack in different ways to create different looks . Along with this stacking toy , the box also had some crayons . 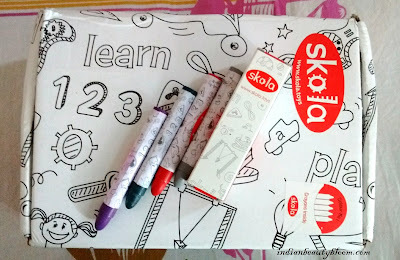 And the box itself is too good with some alphabets and images drawn on it which a child can color with these crayons . * Made up of wood so non toxic . * Eco Friendly product . * Has smooth and fine edges so no chance of getting hurt . * Since its so colorful , looks attractive and one can also teach about colors to kids showing these stacks . * This Stacking toy helps to develop fine motor skills in kids as it enhances the eye and hand coordination . * It teaches them Geometry as kids learn about various shapes like circles , square , triangles etc . 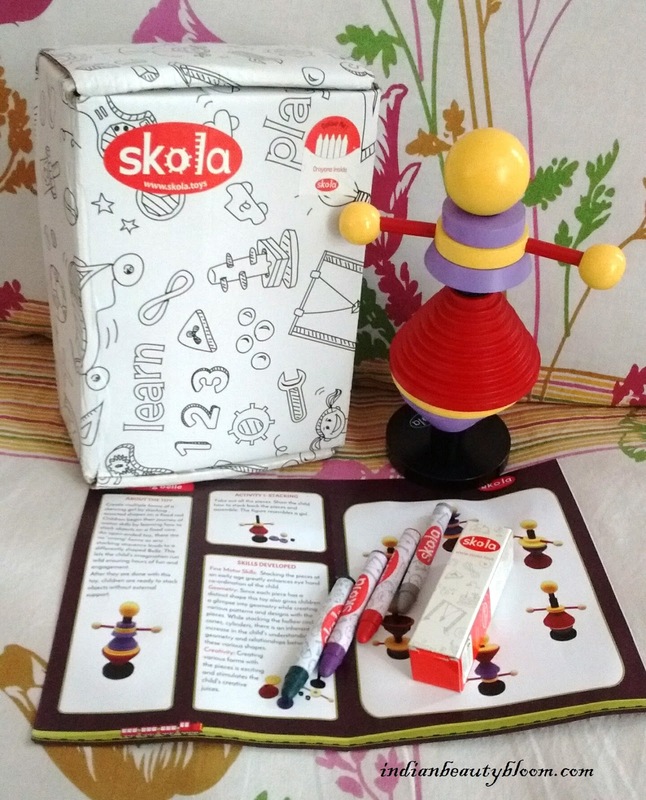 * It develops creative skills in kids , they learn to create new shapes with these stacks . * Product Packaging is excellent and the card board box itself is too good which can be used to fill colors . Overall I am too impressed with this Toy and would recommend other to have a look at their website and their wonderful collection of toys for your kids .